With Valentine’s Day fast approaching, what better excuse to turn your child’s play kitchen pink? We’ve found the perfect place for you to kit out any pretend food collection with all things pink, red and cavity free. 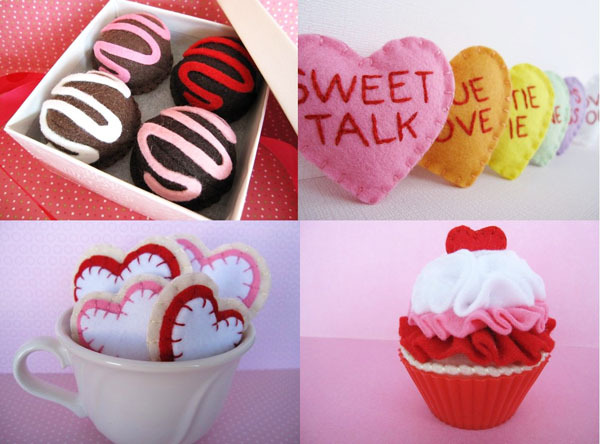 Sewn Sweets have the most delightful pretend Valentine’s Day treats, all entirely handsewn and made from felt. Everything on offer would make a stunning addition to any play food collection and begs to be lined up for some pretend high tea play. My favourite, the Life Is Like A Box Of Chocolates set (pictured above, top left) comprises four gorgeous chocolates – two dark and two of the milk variety – and like all good quality bonbons, comes presented in a crisp white gift box! The Valentine Cookie Set contains six ‘biscuits’ while the Sweet Heart Sugar Cookies Set comes with two large and two small heart-shaped ‘biscuits’ in a gloriously girly blend of white, pink and red. And if those sweet treats aren’t enough, the Valentine Candy Corn Inspired Vanilla Cupcake (pictured above, bottom right) is a sight to behold. A majestic cupcake with layers of ruched felt icing, it’s topped off with a cheeky red heart that nestles neatly in a red Wilton silicone baking cup. Perfection. Prices for these cute, calorie and cavity free Sewn Sweet treats start at US$7 and are available from Smollerup. International delivery to Australia is available.